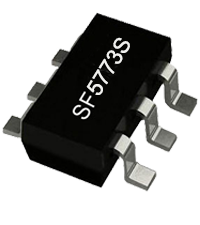 SF5773S is a high performance, 2nd Generation Quasi-Resonant (QR-IITM) PWM controller for offline flyback power converter applications. The built-in proprietary QR-IITM technology with high level protection features improves the SMPS reliability and performance. In SF5773S, the "Digital Anti-Jitter" function can automatically select and lock a valley at a given loading, which can achieve audio noise free operation. On the other hand, the "Digital Frequency Jittering" function makes the system have superior EMI performance than conventional QR system. SF5773S is a multi mode controller. When full loadings, the IC works in CCM mode or QR mode based on the AC line input. When the loading goes low, the IC enters into "Digital Frequency Foldback" mode to boost power conversion efficiency. When the output power is very small, the IC enters into burst mode and can achieve less than 100mW no load power. SF5773S integrates functions and protections of Under Voltage Lockout (UVLO), VCC Over Voltage Protection (OVP), Output Over Voltage Protection (Output OVP), Cycle-by-cycle Current Limiting (OCP), Pin Floating Protection, Over Load Protection (OLP), AC Brownout Protection, Soft Start, VCC Clamping, Gate Clamping, etc. In SF5773S, the protection functions are auto-recovery mode protection. SF5773S is available in SOT23-6 packages.